Your sailboat will have an Entertainment Ideas booklet. This will give you lots of ideas and include fun activities such as knot tying, naming parts of the boat, local history, nautical terminology and much more. 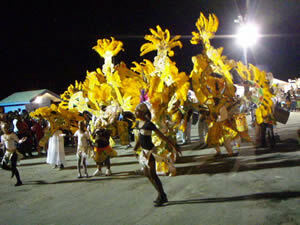 A local cultural festival called a Junkanoo is held on various holidays and during the summer months. This usually includes a performance by the Bahamian Police Marching Band, the Junkanoo 'Rush Out' as well as other local performers. This is great fun and provides good family entertainment. At other times you can find open-air concerts by various local musicians, such as the Barefoot Man and Stone McEwan. Each year, during the first week of July, there is a well attended Sailing Regatta. This involves hundreds of sailboats from every class and category all gathering together for friendly rivalry and serious competition. The regatta races are spectacular to see as they travel southwards from Green Turtle Cay. July 4th is always marked with fireworks and celebration, as is Independence Day in the Bahamas, which takes place on July 10th and is in the middle of Regatta Week festivities.